In the fall of 1989 I started my freshman year of college at St. Gregory’s College in Shawnee, Oklahoma. It was a private two-year school with an enrollment of less than 200. One of the guys that lived on the same floor as I did was a guy named Ty. Ty was a good guy, but we used to make fun of him and mimic him for some reason with a phrase I guess he used to say a lot: “You ready to go to lunch?” You had to say it almost like it was one word in a soft monotone kind of way – youreadytogotolunch? For some reason, in our 18 and 19 year old humor, we thought this was funny and it just became one of those catch-phrases we would repeat over and over for days and weeks and months on end. I’m not sure what Ty thought about it. He probably hated it. Youreadytogotolunch? I remember Ty for that one specific phrase and also because he was the first one I knew with a cd of this brand new country singer from Oklahoma named Garth Brooks. I’d never heard of Garth, but I listened as Ty explained how Garth went to Oklahoma State University (just about 60 miles away in Stillwater), and how he used to sing in the local clubs around town most notably Willie’s Saloon and The Tumbleweed Ballroom where Garth also worked as a bouncer in the early 80’s. My mom and dad listened to some country music while I was growing up so I had already been exposed to the likes of Kenny Rogers, Willie Nelson, Ronnie Milsap, and Alabama by the time Garth came along. But in late 1989 I wasn’t listening to country at all. My cassette collection purchases in 1989 was made up of the likes of Bad English, Tone Loc, Milli Vanilli (100% transparency I liked “Blame It On the Rain”), and Skid Row among others. 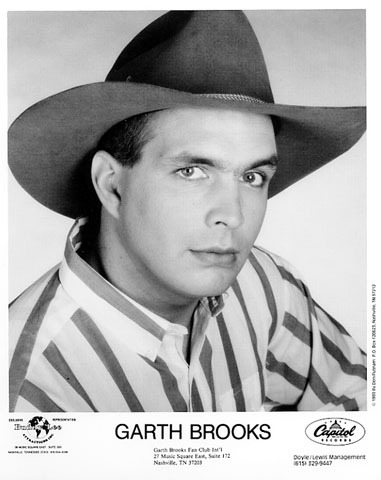 Like a lot of people though, when I took a listen to Garth’s first album I was hooked. I loved “If Tomorrow Never Comes,” “Much Too Young (to Feel This Damn Old), and in particular I loved the final track on the album – a little song called “The Dance.” It was as beautiful of a ballad as I’d ever heard in any genre. Are our lives really left to chance or is it all part of a well-executed design by the master creator? That’s for each of us to consider and decide. I was reading day six of a seven day devotional this morning and the title of the reading was appropriately entitled “The Dance.” That’s really what made me think of Garth and this song, and started this post. The writer in the devotional compared our relationship with God to a dance. She said that sometimes you are perfectly in sync with the creator and His plan as He leads you across the dance floor and through the routine of life, and then there are times when he dips you and you wonder if you’ll ever be pulled back up. Were you dropped or was it just a dip? Does He still have you? Going a little further, I think there are times when you feel like you’ve been left to dance alone. Your dance may be feel off-center. It may feel uncoordinated and awkward. It may feel like a struggle, but just know you’ll be better for it and things will improve. It may be in those struggles that leads you into those brilliant solos in life. The ones that fill you with joy and happiness, and a great sense of fulfillment. That’s just the Creator leaving you in the spotlight while you bust a move and soak in all the adulation. A good partner will do that. A good partner lets his partner shine in a dance… in life. This song was a world-wide hit for Garth and spent three weeks at #1 in the U.S. It was the fourth and final single off of his debut album and wasn’t actually released until April of 1990, but by then anyone who owned the album (released in April of 1989) was well aware of the beautiful ballad. My wife and I went to see Garth arguably at the pinnacle of his career when he was on tour and playing sold out stadiums and arenas everywhere with incredible passion and showmanship in the late 90’s. We sat near the top of the Myriad Convention Center (now Cox Convention Center) in OKC as Garth ran around the stage, swung on ropes, and splashed water from water bottles onto fans. He made you feel like it was the last show he would ever perform. Like it might be the last concert you ever see period. That’s easily one of the most lovable things about Garth and a major part of his success – the genuineness with which he performs. It’s heartfelt. It’s real. And the fans absolutely love it. Thanks for reading and enjoy your dance today. This entry was posted in Uncategorized and tagged Garth Brooks, life, St. Gregory's, The Dance. Bookmark the permalink.